I recently got a question from a listener about my thoughts on the new spider mist systems. It reminded me that I haven't made a strong enough and concise statement about mist systems in this newsletter format. 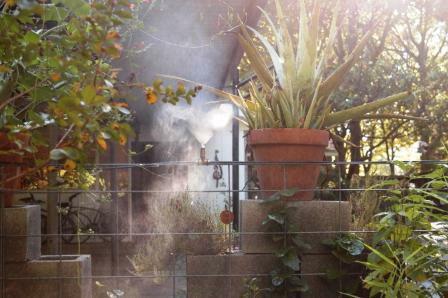 Although I have tried various mosquito mist systems, none have been found to be problem free and none have been found to control the pests without burning plants and/or killing beneficial insects. Therefore – I don’t approve of mist systems. Let me rephrase that...I strongly advise against mosquito and spider mist systems. In addition, most of the systems use pyrethroids or natural pyrethrum (pyrethrins). I strongly oppose the use of both of these toxic products. These products are toxic to birds, frogs, lizards, cats, dogs and you. Yes, pyrethrum is natural - so are arsenic, hemlock and ricin. Garlic, as explained in our past newsletter (see archives), works better and is non-toxic. For spiders - vacuum them. If people are still trying to push these unacceptable products on you, here's some new research and information that might help you make the right decision - see Perils of the New Pesticides.